New details about the cast list of Marvel's Spider-Man reboot has leaked online. We already know Tom Holland is playing Peter Parker and Marisa Tomei is playing Aunt May in the 2017's movie. A new leaked image featuring the entire cast of the movie, is making the rounds on the internet. The image teases Robert Downey's cameo in the movie and also reveals which villains Peter Parker will battle in the movie. According to the list, Titanic star Billy Zane will be playing the role of Vulture, one of Spider-Man's all time greatest nemesis. However the casting choice with Jason Biggs as Scorpion, is a little far sighted. Movie Pilot reports, "The American Pie and Orange is the New Black star has mainly been more of a comedic actor during his career and I'm not sure how he would do in the role of a super villain. I don't like to judge a casting choice before I see it but I am unsure about this one." Another surprise in the leaked list is that Robert Downey Jr's Tony Stark is making an appearance in the movie. House actor, Hugh Laurie is in final negotiations to play J Jonah Jameson claims the report. 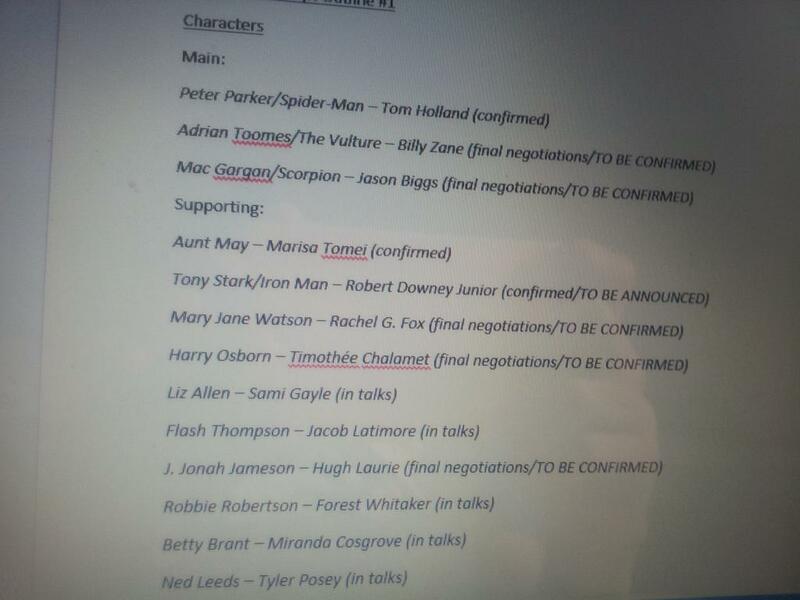 However, there is no official confirmation from either of the actors or from Marvel about the cast list yet. Screenwriters John Francis Daley and Jonathan M Goldstein in an interview teased the new Spidey movie, which will open with a nerdy Peter Parker in high school. "The tone will be really grounded, about a real kid who gets these powers and what that means with a geeky, outcast kid and how he deals with them," Goldstein told USA Today. "You don't instantly become a superhero, it's a long journey. [Peter Parker] is spending a lot more time in high school. And so we have time to sort of develop the powers with him and experience the wish fulfilment. And also just the fact that it's really alienating to other people." Marvel's Spider-Man is slated to release on 28 July 2017.